Did look a bit dodgy. Acesinc..? His coach Barry Stark posted this. Legal but under review apparently. Eraserhead nailed it with the Barry Stark video. Absolutely, positively legal, nothing dodgy about it at all. This is a case where unfortunately, I find myself in disagreement with Steve Davis even. Not a grey area of the rules at all. departure from the traditional and generally accepted shape and form." This rule was written as it is because sometime back in like the 1920's or '30's, somebody was in a situation that he wanted to cue low and parallel to the table, but the White was a half-foot away from the cushion. The player pulled out what was essentially a miniature replica of a cue stick the length of a biro with an actual tip on it and played the shot. This was perfectly legal but seemed quite odd at the time. Thus, a new Rule was born, that which is written above. Right about the 3:00 mark, Barry mentions that the legality of this technique is under debate. I personally am on the side that this should remain legal, no reason to change. The reason that I hold this opinion is because of what Barry says then at about the 3:27 mark...."...providing this piece of equipment is recognized by the EASB as a legitimate piece of equipment." (The WPBSA Rule Book states, "...All extensions, adaptors and other devices to aid cueing must be of a design approved by the WPBSA Ltd.") THAT is the important bit in my opinion. So if you were to invent a device that would steady your bridge hand for this type of shot...say something that clamps to your forearm and lowers down a tripod onto the table surface to stabilize the whole set up...well then, THAT would clearly be illegal because your clever invention is not recognized by the Rules Authority. In fact, if an actual movement is made to outlaw the use of Spider this way, then I would add that it ought also be illegal to perform the stroke that Barry does at about the 2:00 minute mark in the video...that is, using both the Spider and the standard rest for a single stroke. That is an old trick that I have known for decades and certainly, that should not be illegal in my opinion, though one ought to think it should be illegal if Wilson's stroke ought to be illegal. (ii) uses any object to measure gaps or distance;..."
So if Kyren Wilson's tactic is going to be made to be illegal, then in a similar way, the Rules will need to be amended to say something along the lines that approved equipment may only be used for intended purposes and no other. 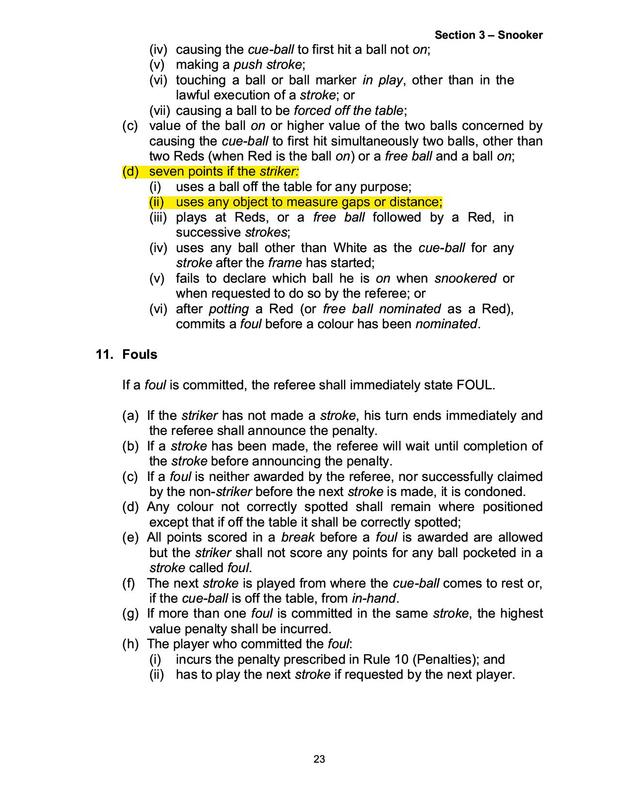 Personally, I think this area of the Rules is just fine as written and Kyren Wilson's shot was and should remain perfectly legal. Here is a clip of the chalk incident acesinc. Thanks for another write up. Thanks Ace for the reply which clarifies the position. For what it is worth,I agree with you that there was nothing wrong with what Kyren did any more than a conventional use of the spider and furthermore that the rules should not be changed. The Barry Stark clip was also illuminating. I also think that it would be pedantic to have picked Ronnie up for his use of the chalk. Thanks for this reference Eraserhead. Without seeing more context of what Ronnie was trying to do here, I am still not certain whether it should be called as foul or not. From the few seconds I see though, I have to agree with Ken Doherty, it does look like a foul should have been called. Placing any object on the table surface for purpose of measurement of any kind is illegal for the players. The referee can and does do this regularly for instance, when checking on a particular type of foul or checking if a Free Ball is appropriate. It is fine for players to place objects on the table for temporary storage, such as if one changes his mind and decides not to use the rest for a particular shot, he can just leave it sit there for a moment. (We all probably know the humorous incident in which Mark Williams hands were full so that he could not retrieve his extension before the rebounding White struck it!) But placing the cube of chalk like this is crossing a line. Similarly, when trying to calculate a rebound angle to escape a snooker, it is fine to hold your cue in the air near the cushion you intend to strike and swing it around to mimic the angle on the other side. Illegal would be to actually place that cue on the table surface at that angle from the cushion, then run over and grab another cue from the wall rack and place it at an equal angle coming off the cushion. Clearly crossing a line. May as well break out a compass, pencil, and sheet of paper to calculate. Maybe even a laser beam and mirror. I have stated in a post or two in the past....the Rules on occasion attempt to create "trigger points" to assist the Referee in knowing what to watch for and when to watch for it. It is simply not humanly possible to watch any and every thing at any and every time for any and every possibility. Placing the chalk in this manner should have acted as a trigger for the Referee to call, "Foul!" Sorry to disagree with you on this one Player. No worries - I am better informed for it. It is common at my club for an opponent to remove a ball from a pocket and use it to check if a gap wide enough for the ball to travel through exists i.e. between two obstructing colours. I had never objected but summise that a referee would call foul. Badsnookerplayer wrote: No worries - I am better informed for it. You can download this, print it out, and bring it into your club for the event that this illegal, illicit activity is a common occurrence there. Ammunition for your arsenal. Some players (I include myself and you in this group) are true students of the game and therefore prefer to shed the light of truth on these subjects, whatever that truth may be. It seems to me that most however would rather carry on in ignorance and prefer to continue doing things as they always have, actual rules be damned. It is up to you to determine what sort of personalities with which you are dealing. For a time I tried to educate players about what an actual "push stroke" is only to be condemned as a cheater myself as I was obviously trying to call a push against players when clearly to the eyes of the ignorant, no push had in fact occurred. As a consequence, I don't call any foul on anybody for anything anymore. I just have to chuckle internally when I see such things. I admit that I have become cynical about trying to advance the Snooker locally here; most everyone in my club already know everything there is to know about everything so I tend to focus my attention on a couple of open-minded players at my disposal and of course, my son (back from uni in a couple weeks to visit for a short time!) in order to help me advance my game. Improvement comes much easier when dealing with like-minded individuals rather than adversarial opponents. I would rather save the adversary for tournament matches; use the friendly matches to improve performance. Few seem to agree with that and instead prefer to view even the simplest, friendliest match as if the World Championship were riding on it. Some players (generally the same type that would use a ball to measure a gap) have a tendency to use a pocketed Red in an effort to check if a Colour may be spotted without interference. Also, quite illegal. Thanks Ace - I am apt to give every benefit to my opponent unless they are lairy in which case your commentary will prove invaluable. I play snooker to enjoy it and I value as much the performance of my opponent as long as i feel that I have given a fair account of myself. Despite recent travails in the pursuit of frame wins - and monetary gains - I still would rather be defeated by an opponent playing lovely snooker than win by grinding relentlessly. I recognise the traits you mention in some people who wish to win at all costs; I still witness it in our local Sunday competition as otherwise sane(?) adults flirt with raw and extreme violence over a perceived conservative competition handicap or rough bounce of the cushion. I hope you enjoy the forthcoming frames with your son. My father still plays and is currently driving me mad as we have played a couple of sessions recently and he has pasted me 9-3 and 8-2. He's 73 and still a mean player - but next time he uses a ball from the pocket to measure a space I'll have 7 points off the old bugger. Badsnookerplayer wrote: ...but next time he uses a ball from the pocket to measure a space I'll have 7 points off the old bugger..
Badsnookerplayer wrote: I still would rather be defeated by an opponent playing lovely snooker than win by grinding relentlessly. I express exactly the same sentiment saying that I would much rather lose a well played frame than to win a frame of utter crap. Sorry to root against you my friend, but good for your Old Man! In any match between two entities on the Baize, my instinctive tendency is to cheer for the old guy. Probably a result of the fact that I am more than peeking over the hill myself. In this case, it is you who are the young whippersnapper that the old stud is obliged to keep in line. I would love to see Ronnie win his next WC the year he turns fifty. And beyond! I have checked the rules and this is legal and in the spirit of the game unless Ace will convince me otherwise. It sounds like everyone is having the security certificate problem I am seeing. I saw another thread that you said DC is working on it. BSP, about your link though, I can't watch it. I get the error message that it "cannot be streamed in your country". So all I have is a thumbnail picture and I see Luca is resting the rest head along the rail rather than the bed of the table so I assume that is the point of the video. Of course, nothing illegal about that if I interpret correctly. Back in the day, there used to be a little plastic extension that would clip onto the "X" rest head to extend over the rail for this sort of shot. I did see it used professionally on telly maybe only once or twice in my time viewing back in the 80's so presumably it was legal and certainly made this type of shot easier. Perhaps it has been outlawed since, I don't know. I have not seen a pro use one of these devices in the Internet age that I have been able to watch the game again. Are you allowed to say stack several extensions and the spider and even the swan neck on top of each other? I mean you could potentially pile the 4 implements on top of each other? Dan-cat wrote: Are you allowed to say stack several extensions and the spider and even the swan neck on top of each other? I do declare that is legal. Ace: yup I'm in contact now with Roland's cousin who does the site admin I expect a resolution very shortly. Roland suggested I politely nudge him and so I have done. I remember that little plastic thing they put on the rest too and haven't seen it for ages. Baddy: your Dad! I'm with Ace on this one. 73 and beating you and you're a great player! Brilliant. Yes, I shall endeavour to get into a position in the club tomorrow where I have to pile all 4 implements on top of each other, and use this thread if my opponent complains! Keep pestering them until the site gets fixed. Don't let them have a moments rest until its done. Nag them like an old wife all day if you have to! Cloud Strife wrote: Good job Dan!